Women who found themselves caught in the web of the mob have always avoided publicly expressing their feelings. Yet a few have come forth with riveting stories exposing a feminine side of the “life”. We can go way back to the earliest published testimonies from women like Rosalie Bonanno (“Mafia Marriage”), Sandy Sadowsky (“Wedded to Crime”), Cecile Mileto (“Louie’s Widow”), Antoinette Giancana (“Mafia Princess”), Andrea Giovino (“Divorced from the Mob”) , Various authors (“No Questions Asked”) and Victoria Gotti (“Family of Mine”). These brave women took to the pen and opened their heart and soul to tell the world of their experiences. The majority of their time was not pleasant but full of dramatic twists of turns. The long term affects of their experiences left them with “scars” that never heal. Recently another brave woman has decided to follow in these women’s footsteps. Toni Marie Ricci the ex-wife of Michael “Mickey Scars” DiLeonardo has took on the task of penning her life and times with Michael. For those of you who do not know, Mickey Scars was a captain in the Gambino Crime Family and a close confidant of John Gotti Jr. In reality before he branched out and became a part of the “life” he led a legitimate lifestyle. In comparison with Michael, Toni Marie was more suited for the “life” than he was. Her uncle, cousin and brother were all “connected” to that world. As a young girl she was unaware of what the men in her family were involved in. At the tender age of nineteen she met Michael whose first advance seemed to border on oddness. Her father and the rest of her family warned her not to date him. They did not want her to end up with someone who is a “knock-around guy”. But Toni was the type of woman who the more you deny her what she desires the more she will fight for it. Michael did end up pursuing her until he won her over. Michael came in contact with John Gotti Jr. at an affair and they “clicked” instantly. Their friendship began to grow from there. Junior became very close to the DiLeonardo family especially after he came to the rescue of Toni’s brother Frankie. Frankie was in a terrible accident and was going to be taken to Jamaica Hospital instead John rushed him to North Shore Hospital. Another time was after Toni’s father died he offered his assistance with anything her mother needed. “He was like a second brother to me,” admits Toni. As time passed they had a son, Michael Jr, and Michael also would become godfather to John Jr.’s second son. Their bond with the Gotti family grew even stronger. One night Michael told Toni that he was going to Atlantic City with Junior and a few other guys for the weekend. Toni did not like the idea. Normally any other “mob wife” would have kept their mouth shut and not ask questions. 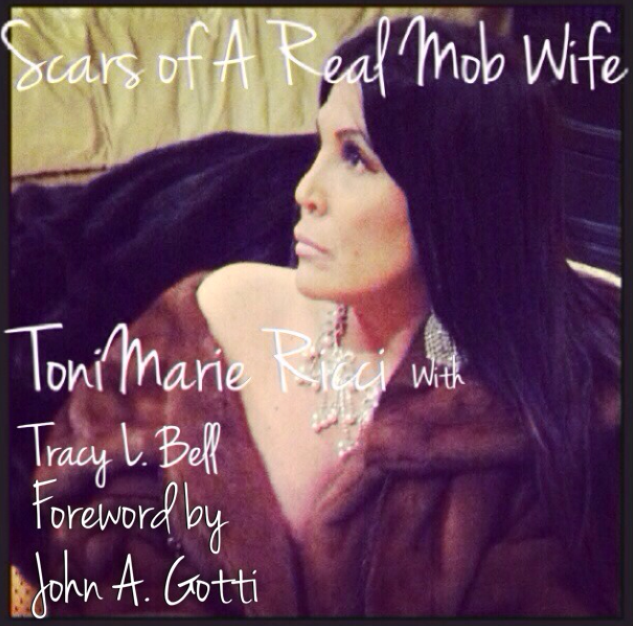 Toni was nothing like the old school mob wife. John Junior made a special visit to the DiLeonardo home to speak to Toni personally. He made it clear to Toni that they were just going to gamble and relax, no women or booze. Toni was very taken by John’s sincere effort to calm her fears. Mickey Scars eventually joined the “boys” for the weekend break. But things began to unravel for Toni and Michael. He began coming home very late or not at all and was being very evasive. This began to worry Toni and she of course pressed for answers and of course was denied. What followed was physical and verbal abuse. Her patience was reaching a boiling point. But Toni was not prepared for what was to come in the near future for her and her son. After serving in the Gambino family since 1988 Michael was about to the do the unthinkable. After being indicted in Atlanta on a slew of charges in September 2000, he managed to be acquitted the following year. But in 2002 the FBI caught up with him again but this time for murder. At this point in fear of living the rest of his life in prison he joined Team America. This was where Toni saw the writing on the wall. It was time to re-evaluate her place in the world. Her son Michael was her life and she was not about to botch that on account of her now “turned rat” husband. Then the news that he had another woman and another child was the “straw that broke the donkey’s back”. Toni was not going to stand for that. By the time Michael testified in court and brought many men down with him, Toni had already filed for divorce. Presently, after many years of emotional torture, Toni has learned to live with it and wanted to share the truth with the world. She is due to release her “tell all” book “Scars Of A Real Mob Wife” which details her trials and tribulations of being married to Michael “Mickey Scars” DiLeonardo. Toni has already appeared on Discovery Channel’s “Married to A Mobster” where she spoke about her tragic life with Michael. It is a book like no other as it brings forth the true essence of that “life” in more modern times. The book is not meant to glamorize or focus on the “life” but to harp on the emotional and physical abuse that women deal with every day. Toni, a Brooklyn native, resides on Staten Island with her son Michael Jr. and is excited to release the book sometime in August 2013. A must-have for all who want to learn the truth behind the close doors of the “life” seen from a woman eyes.